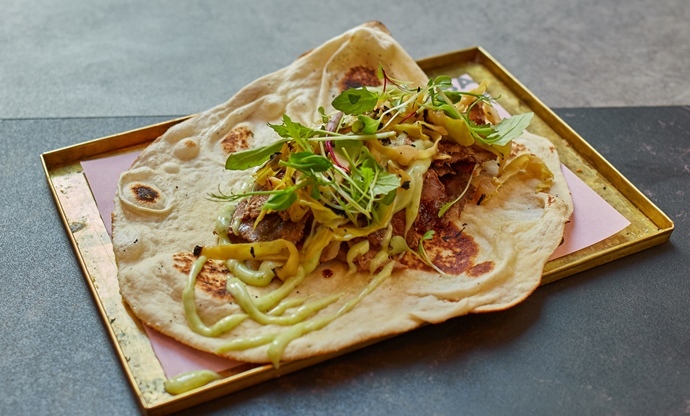 Bread, meat, pickle, sauce – on the surface a kebab might seem like a simple thing, but at Maison Bab they’re pushing this beloved dish into new gourmet territory. 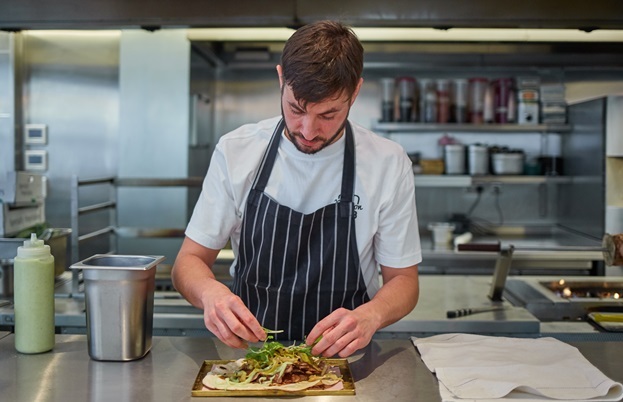 Tom Shingler talks to head chef Manu Canales to discover how he’s using his classical French training to bring something new to the poster boy of Turkish cuisine. I really, really like kebabs. From the dirty, late-night, probably ecoli-ridden, elephant leg doners of my teenage years to the more traditional authentic Turkish skewers and shishes I now indulge in whenever I get the chance, if there’s some spiced meat stuffed inside a flatbread I’m there. It’s something about the way all the elements come together in every mouthful – rich meat, tart pickles, crisp salad and a combination of hot and creamy sauces – that just makes them such a joy to eat. In my eyes, they beat sandwiches and burgers any day. 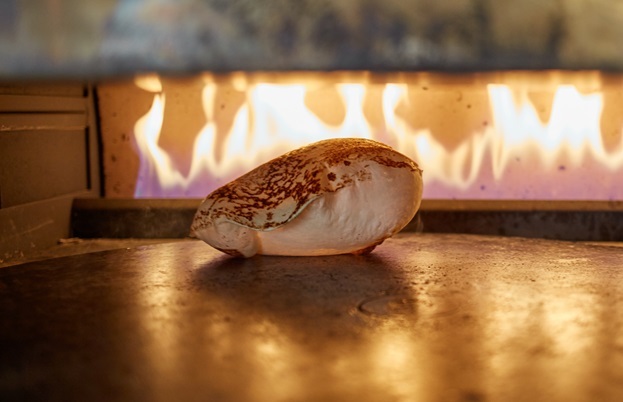 That’s why I was particularly excited to talk to Manu Canales of Maison Bab – a new two-storey restaurant in Covent Garden specialising in the Middle Eastern delicacy. I was interested to see his take on the dish, especially considering his background. Originally from rural Spain, he studied biology at university before moving to Ireland after the recession hit in 2008. 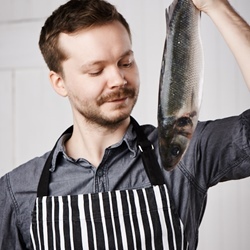 A job as a kitchen porter followed, he caught the cooking bug and, after completing a course at culinary college, he managed to get a job as a commis chef at Le Gavroche. It was here that he met fellow chef Ed Brunet and his close friend Stephen Tozer, and the three of them started selling kebabs on the street food circuit. Quite a unique way to end up selling something often regarded as post-drinking fodder. 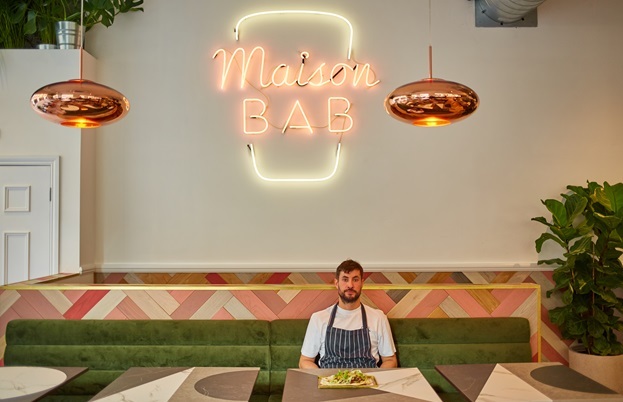 Maison Bab has been a good few years in the making – Manu, Ed and Stephen first started out as a street food stand, before opening their first bricks-and-mortar kebab shop Le Bab in Kingly Court, Soho. Maison Bab, which opened in September 2018, is much, much bigger, with a cavernous dining room built around an open kitchen, as well as a basement area. 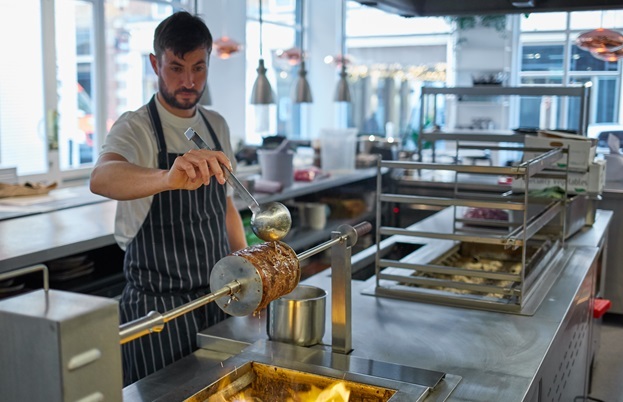 It’s a sign that the trio have found their groove in the world of kebab-making, becoming more confident in what they offer compared to the more archaic dishes from when they first started out. 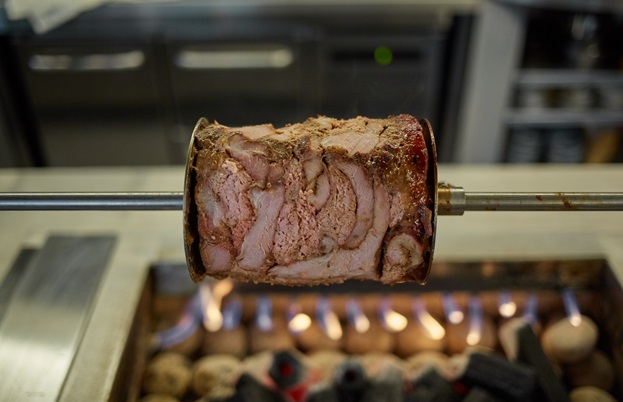 There are plenty of places in the UK where you could get incredibly good kebabs long before Maison Bab opened – Green Lanes in north London, for instance, is a famous hotspot for incredible Turkish food (and a trip there is a pilgrimage any kebab-lover should definitely make). So how is Manu managing to convince people his new-kid-on-the-block kebabs are just as good? It comes down to his time at Le Gavroche, where he and Ed gained a thorough grounding in the fundamentals of good cooking. Even though they were cooking filet de boeuf rather than lamb Adana, the same dedication to perfection applies to each dish. 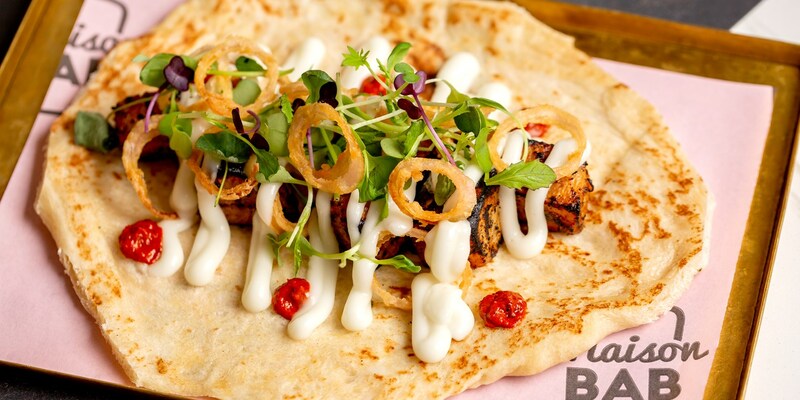 Slightly unorthodox, but judging by the menu at Maison Bab it definitely works – every single thing on there, from the doner beignets and ‘meat butter’ flatbreads to the pork shawarma and barbecued mutton, is absolutely delicious. Dishes evolve and are adapted as the seasons change without straying too far from the traditional idea of what a Turkish kebab is. It’s an indulgent, affordable, crowd-pleasing hit that ticks all the right boxes – especially for someone who loves kebabs as much as I do. 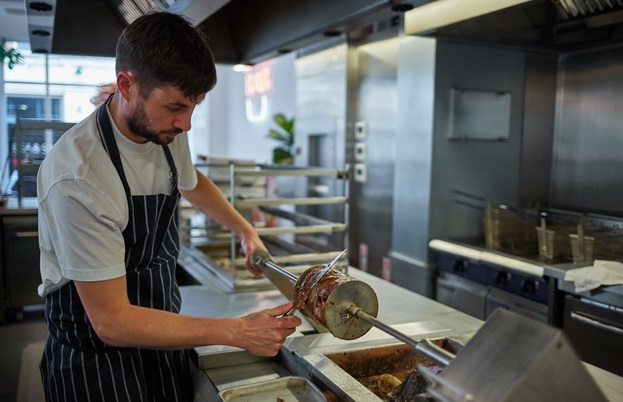 And when Kebab Queen opens – Maison Bab’s tucked away chef's-table-meets-private-dining-room in the basement – Manu will really allow his creativity to run wild. ‘Kebab Queen is going to be a totally different gig,’ he says. ‘I don’t really know what to call it – it’s sort of a mix between a chef’s table and an elaborate tasting menu, but all focused on kebabs. Kebab Queen will give us a chance to get more experimental again and really push the boundaries.’ Frankly, I can’t wait.